Fact is, I work with them. They’ve been working at our school since last August. Nick (I’m not making this up – his name is Nicholas Claus) works as an aide for one of our special needs kids. Which, when you think about it, rather sounds like the sort of job Santa would have, don’t you think? His wife is our testing clerk. Meaning she assists our Special Ed students on their tests. As I’m sure you can imagine, those of us working in the front office were all atwitter with the thought of adding Mr. and Mrs. Claus to our staff list. But I want you to know, we made a pact with each other that we would not make any jokes about his name, assign him a parking spot for his sleigh, or ask what his commute time is coming in from the North Pole. We were going to conduct ourselves in a mature, professional manner. “He’s got a beard!” she told me excitedly. Sure enough, our Nicholas Claus has a beard and a belly. The beard is not white, but I think it’s safe to say it’s headed in that direction. No idea if his belly shakes like a bowlful of jelly. I suppose it could. Other facts about Mr. Claus: he favors flannel shirts, jeans, and sneakers. He is soft-spoken, rarely talks, and is never seen without his black canvas messenger bag at his side. No one knows what it is in this black canvas messenger bag. One presumes it contains a list. As for the Mrs.: She is a very pleasant, cheerful woman, with the loveliest British accent you ever did hear. Yes! Mrs. Claus is British! Who knew? But here are a few additional clues: Once the holiday season began, Mrs. Claus put outside her classroom door a decoration. It was a North Pole with a mailbox attached to it. Cool, right? Not only that, Mrs. Claus knit little stockings, filled them with candy and put them in all the staff mailboxes. Intriguing, yes? And now we get to the heart of my tale. For as it is with all people, even the sweetest, kindest of people, they still have flaws. If you do not wish to know Mr. and Mrs. Claus’ flaws, then you should stop reading now. After the aforementioned Staff Christmas Party, hosted by our Administrators, there was much food left over. Food that our Administrators paid for, understand? Food they brought to work for their lunch, which they eat in the Administrative Conference Room. “Have the Claus’ come out yet?” she asked me. “Come again?” I repeated, always a little slow on the uptake. Here’s what happened: While our Admin were pulling lunch duty, Mr. & Mrs. Claus went into the conference room. Bonnie (for this is the other secretary’s name) saw them and asked what they were doing. Mrs. Claus reportedly said that they knew there was food left over from the party, so they came down for lunch. Just like that! No feigning ignorance, no by your leave. They just saw food and they took it! I’m telling you, the shock felt by the front office staff was a sight to behold. I wanted to get a picture of the Claus couple enjoying their lunch, but alas, all I got was a picture of Santa leaving the scene of the crime. Please note the black canvas messenger bag at his side. After giving the matter some thought, I think I can explain the odd behavior of our Claus’. I believe it has to do with spending so much time in public service. You see, I first heard of this phenomenon in reference to politicians. Often, for people who spend so much time in the public eye, they can lose sense of what is appropriate behavior. And when you add in the fact that Santa regularly enters homes where plates of cookies and treats are set out especially for him, well, it stands to reason he’d come to think of all food as open game. So let this be a warning to you. If you plan on finding presents under your tree this Christmas, don’t forget the treats! For if you do, he may open your fridge and help himself! These little bars are super easy to make, yet super delicious. People will be begging you for the recipe. No kidding. In large bowl, combine flour, brown sugar and butter, mix until fine crumbs form. Press into 13×9 inch baking pan. Sprinkle pecans over crust. Make Toffee Topping: Put 2/3 cup butter and 1/3 cup packed brown sugar in a small saucepan. Cook over medium heat, stirring constantly, until it begins to boil. Continue cooking and stirring for another 30 seconds. 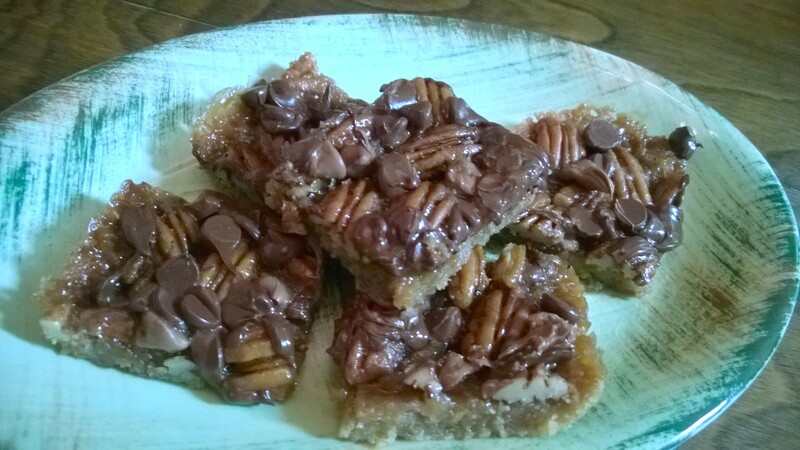 Drizzle toffee topping evenly over pecans and crust. Bake for about 20 minutes, until topping is bubbly and golden; remove from oven. Immediately sprinkle chocolate chips on top, pressing gently onto surface with a spatula. Let cool completely before cutting into bars. I would be hard pressed to deny the Claus’s anything! Especially at Christmas time! Plus, they have to take the opportunity when they can; they have very busy schedules this time of year. Merry Christmas! Very true, they are indeed busy people! Merry Christmas to you as well! Well, there you go – now we know Santa’s day job. Yes, he has quite an operation to run, plus I believe those elves are union workers. He better keep that income flowing! Wow! Who checks Santa on the “naughty and nice” list? Right? Dang, it’s like he’s the pope or something! I don’t know about the Clauses’, but I can tell everyone I’ve made your toffee bars and they are scrumptious! Merry Christmas! Thanks Diane! Always nice to receive a positive review! I have to ask: Was an anonymous note stapled to the wall after The Incident? Ha ha, this is great! I always assumed that Santa and the misses had to have some sort of human flaw, but they deserve a pass. After all the good they have done! Thanks for sharing this and have a wonderful holiday! Yeah, I suppose their good deeds speak for themselves. Thanks for dropping by, and I hope you have a great Christmas! I’m glad Mr and Mrs Claus have a way to get through the year – I did worry. Thank you for brightening up Christmas with your happy tale! I think a lot of people just assumed Santa and the Mrs. were independently wealthy, but nope, they’re working class just like the rest of us! Glad you enjoyed the tale – Have a merry Christmas! Next Next post: Do You Keep Christmas Well?